As most of you know I’ve been on a slightly healthier kick lately, focusing primarily on chicken, lean meats and vegetables. Sometimes I struggle with finding interesting dishes to make, but here’s a dish that I made the other night that was an absolute home run… Pasta Primavera with sautéed chicken, topped with toasted garlic, lemon & parmesan panko. Let me put it this way, my wife and I were truly upset when we finished because we wanted seconds so badly! Ok, I know it seems like a lot but trust me when I tell you it’s really not that bad. This is not a hard dish to make. First thing’s first, let’s get the panko topping done since it can be added at room temperature anyway. This way there’s one less pot/pan on the stovetop while everything else is going. You’ll need to be on your toes for this because panko can go from lightly browned to burnt in a blink. Heat a sauté pan on medium-high, add the panko and seasonings (not the lemon or parmesan) and cook until lightly browned, stirring regularly. Once browned take it off the heat and add the lemon and parmesan, stir well. Some of the panko might clump up a little when you add the lemon, just break them up with a fork. Set aside at room temp. In a large bowl combine the flour and seasoning from the chicken ingredients and mix well. Add the cubed chicken and coat thoroughly. Heat the olive oil on high in a large sauté pan and add the coated chicken. Cook until browned then flip and repeat. Once both sides are browned reduce the heat to medium-low and cook for an additional 10 minutes, then set aside at room temperature. While the chicken is cooking get a pot with salted water on heat for the pasta, but wait for my cue to start cooking the pasta. Also, it’s time to get the ball rolling on the vegetables. I find it’s easier to make this in a large pot, but if you have a rather large sauté pan you could do that as well. Heat the olive oil on medium heat and add the onion and chopped garlic, along with a pinch of salt. Cook until they start to sweat a little, roughly 2 minutes. Increase the heat to medium high and add the sliced mushrooms, cook for 3 minutes stirring periodically. Add the diced zucchini as well as the salt, pepper and garlic powder, stir everything together and cook for 3 minutes. Increase the heat to high and add the white wine, cook until the liquid has reduced by a third. Reduce the heat to medium, add the diced plum tomato and chicken stock and simmer uncovered, stirring periodically. Once the vegetables are simmering drop your pasta in the boiling salted water. Cooked for one minute less than directed on the packaging, then strain. Add the pasta and chicken to the simmering vegetable broth, increase the heat to medium high and cook for an additional 5 minutes. In the last minute add the butter and grated parmesan and stir in well. Plate the your pasta and lightly top with the toasted panko mixture. So there you have it, my recipe, my recommended pairings. I hope you’ll give the dish and wines a shot, and please let me know if you do! As always, new content will be coming soon. In the meantime crack open a bottle of some small production deliciousness, sit back, and relax. Life is short, enjoy it! 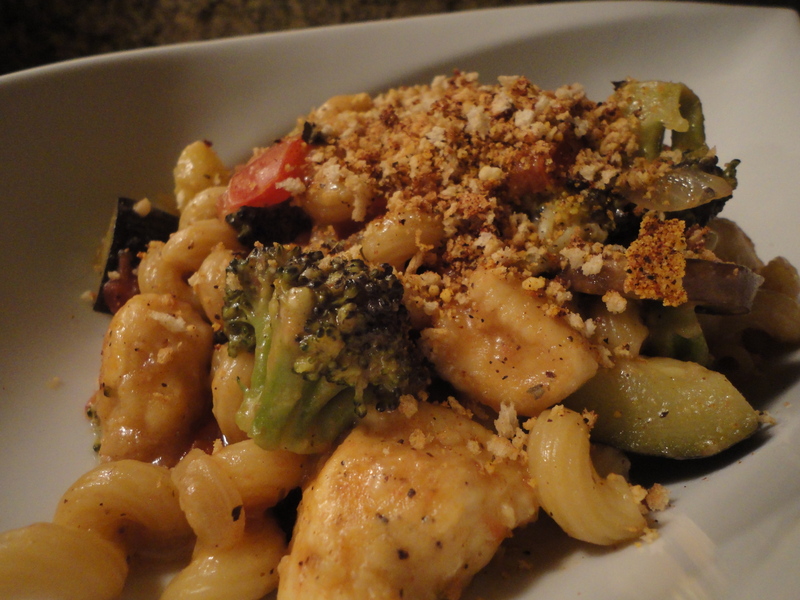 Tags: chicken, healthy cooking, panko, pasta, pasta primavera, perfect pairings, perfect pairings at home. Bookmark the permalink. YUM! I’m seeing a way to make this veg for me and add the chicken to my family’s plates. I really have to try out some of your wine recommendations one of these days. You are so knowledgeable. You took some time off but when you come back you come back with a bang!